Chaitanya’s paper on “Thermally Tunable Band Gaps in Architected Metamaterial Structures” was accepted for publication in Journal of Sound and Vibration! 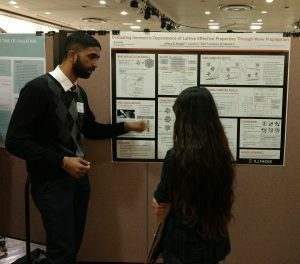 Aditya Shedge presented his research work on lattice geometry and properties at the Undergraduate Research Symposium (URS) at the University of Ilinois. Congratulations to Connor Pierce who received the prestigious NDSEG fellowship! Ganesh’s Paper on “Effective property evaluation and analysis of three-dimensional periodic lattices and composites through Bloch-wave homogenization” was accepted for publication in The Journal of the Acoustical Society of America (JASA)! Prof. Matlack visited the Department of Nuclear Science and Engineering at MIT and gave a seminar on our group’s recent work. 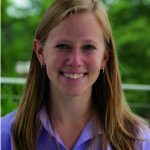 Prof. Matlack was awarded the Haythornthwaite Foundation Research Initiation Grant from the Applied Mechanics Division of ASME for her project, “Phononic metastructures as ultrasonic filters for nondestructive evaluation measurements.” Many thanks to ASME AMD for this support! WPML Participates in the Paper2Tree Project! To give back to the Urbana-Champaign community, in celebration of Chaitanya’s paper in the Journal of Sound and Vibration, the Wave Propagation and Metamaterials lab sponsored a ginkgo tree in Champaign’s Douglass Park. Read more about what Dr. Matlack had to say about donating the tree, and learn more about the Paper2Tree project at https://paper2tree.org. Connor presented his work on “3D Printed Magnetorheological Elastomer Metastructures with Magnetically Tunable Band Gaps” at ASME’s IMECE2018 in Pittsburgh, PA.
Ignacio’s Paper on “On the Interrelationship between Static and Vibration Mitigation Properties of Architected Metastructures” was accepted for publication in Frontiers in Materials! Prof. Matlack visited the Department of Engineering Science and Mechanics at Pennsylvania State University and gave a graduate seminar on our group’s recent work on “Manipulating Wave Propagation with Mechanical Metamaterials”.